New! 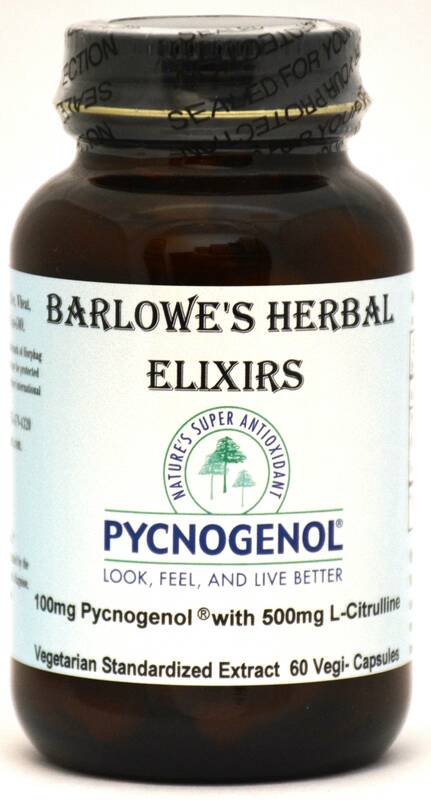 Barlowe's Herbal Elixirs now offers a high quality Pycnogenol® product derived from French maritime pine bark with each capsule containing 100mg of Pycnogenol® (74% Procyanidins) combined with 500mg of L-Citrulline. Pycnogenol® offers numerous substantial health benefits including joint support, increased blood circulation, increased cognitive function, increased endurance, and eye health support. This product is Kosher and Halal certified. Bottled in Glass! No Stearates! No Fillers! No Junk! New! Barlowe's Herbal Elixirs now offers a high quality Pycnogenol® product derived from French maritime pine bark with each capsule containing 100mg of Pycnogenol® (74% Procyanidins) combined with 500mg of L-Citrulline. Pycnogenol® offers numerous substantial health benefits including joint support, increased blood circulation, increased cognitive function, increased endurance, and eye health support. This product is Kosher and Halal certified. The Certificate of Analysis (COA) is shown above. Bottled in Glass! No Stearates! No Fillers! No Junk! Research indicates that Pycnogenol® may play an important role with physical activity because it was shown to aid the body in producing nitric oxide (NO), thus enhancing blood microcirculation and improving blood flow to the muscles. This helps the body achieve peak muscle performance and speeds recovery after exercise, which may result in reduction of muscular aches in both athletes and healthy individuals. Pycnogenol® stimulates the enzyme "endothelial nitric oxide synthase" (eNOS) for enhanced generation of NO from the precursor molecule L-arginine. Plus, the added L-citrulline in this formulation readily turns into L-arginine in the body. The link between Pycnogenol® and sports endurance was first studied several years ago at California State University. Recreational athletes showed an increase in endurance when supplementing with Pycnogenol® as compared to other participants taking a placebo. This increase in circulation also helps support a healthy heart. Five clinical studies with over 1000 patients have demonstrated the Pycnogenol® strengthens retinal capillaries and preserves eyesight. Research has also shown that it can improve cognitive function. Pycnogenol® has demonstrated its ability to promote joint mobility and flexibility and lessen joint pain. Furthermore, it acts as an antihistamine and offers numerous skin benefits. 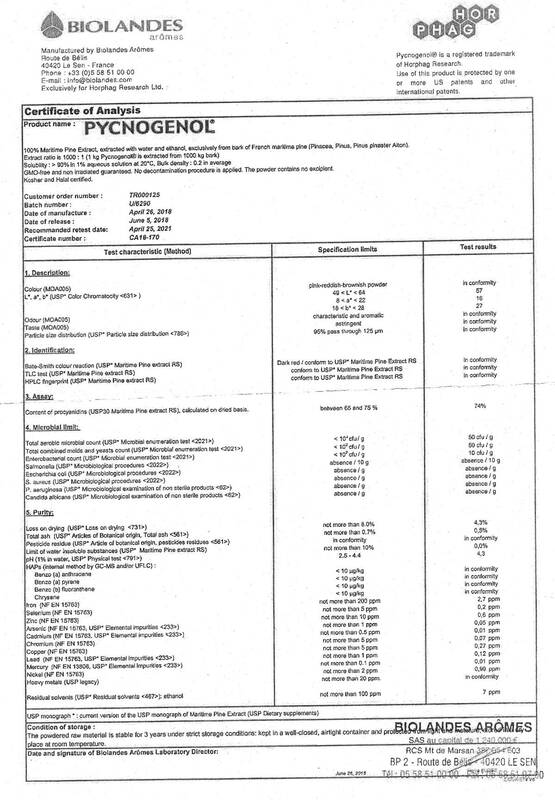 It appears that Pycnogenol® is a general panacea for the human body! 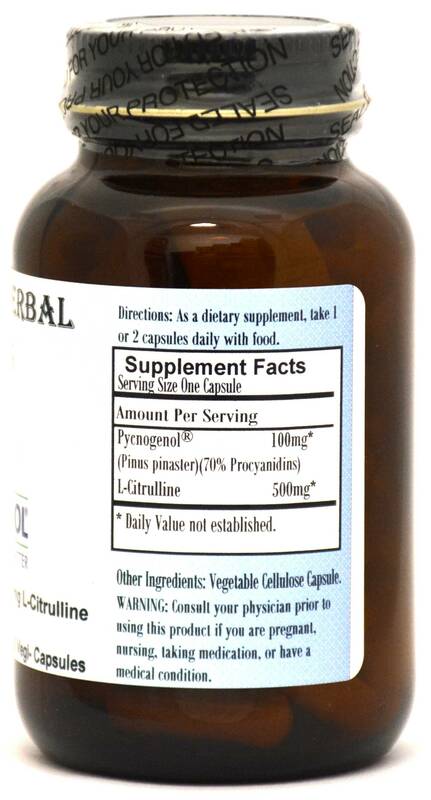 Caution: Barlowe's uses the highest quality Pycnogenol® and though generally safe, it is potent and should be utilized with care. This product is for dietary use. If side-effects occur, discontinue use immediately! The above statements have not been evaluated by the Food and Drug Administration (FDA). This product is not intended to diagnose, treat, cure, or prevent any disease. Directions For Use: Take one capsule once or twice daily, preferably with a meal. Results and usage amounts may vary based on body type and weight.